This is such a lovely little dessert that just brings me back to Provence! It is very quick and simple—just make sure your figs are perfectly fresh and ripe, otherwise the skin can taste a little bitter when baked. My guests always rave about it!! 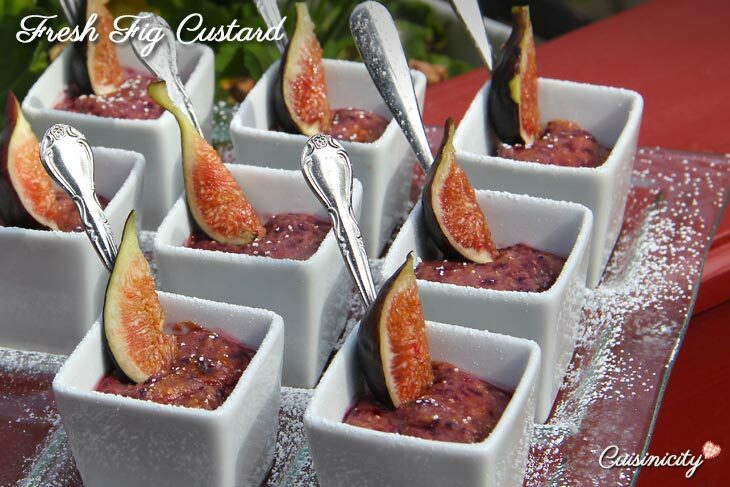 Place a baking dish halfway filled with water in a preheated oven to 350 F.
Remove the stem of 10 figs, place them in a food processor with the yogurt and sweetened condensed milk and pulse until creamy. Pour the creamy mixture into 9 little baking cups and place the cups in the preheated baking pan filled with water. Bake for 15 minutes and cool. Place in the fridge for at least one hour (longer is better) before serving and decorate with the remaining 2 figs cut lengthwise. Do you think this would work with frozen figs? Of course, there is nothing like a ripe fresh fig, but they’re impossible to find here this time of year. Caroline, I would think so. Please do let me know if you try! 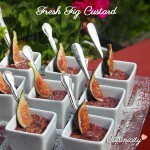 I love this dessert but can only make it in the summer so would love to find frozen figs and try! I have never cooked with figs or even bought them – I saw them at my natural foods coop today – how do I tell if they are ripe and ready? This sounds too good not to try!